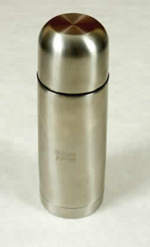 Brushed stainless Steel flask with logo. Both stylish and practical. Capacity is half a litre, so plenty of steaming tea or coffee to go around. Loads more promotional and personalised items besides our Steel flask with logo click here. For more information on our Steel flask with logo click here and fill in the contact form and we'll get straight back to you.